Half a million women (and 800,000 children) die each year from exposure to smoke from primitive cooking fuels (according to the WHO’s Fuel For Life report). Could these lives be saved – not to mention countless others – by a cheap, clean-energy-powered house? Vijay Govindarajan of the Tuck School of Business at Dartmouth wants to find out. Govindarajan has issued a challenge to the business community, governments, NGOs, and foundations to develop a “a mass-produced, standard, affordable, and sustainable solution” – a livable house for the poor that costs just $300. 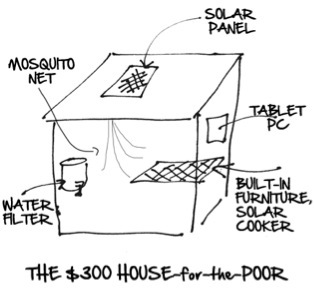 A well-designed $300 house would be a huge breakthrough for the world’s poor – the majority of whom are women. Here’s hoping the world’s innovators and entrepreneurs embrace the challenge! Entry filed under: Uncategorized. Tags: $300 house, Dartmouth, developing world, development, economic development, Fuel For Life, health diplomacy, Tuck School of Business, Vijay Govindarajan, WHO, women, women's development.